Byron Nelson: The Most Remarkable Year in the History of Golf provides an unparalleled examination of the most amazing feat in golf history. In 1945, Nelson won a jaw-dropping 11 consecutive victories on the tour. Overall, he won 18 tournaments that season, finishing either first or second in 25 of the 30 PGA events that year. No golfer since has come close to such perfection. Nelson accomplished his feats over 60 years ago, long before Tiger Woods began setting records, before Jack Nicklaus won his sixth Masters title at age 46, before Arnold Palmer won the 1960 U.S. Open, before any of the historic wins by golf greats Tom Watson, Lee Trevino, Nick Faldo, or Greg Norman. Byron Nelson achieved what no other golfer will ever likely come close to doing again. John Companiotte is the author of Jimmy Demaret: The Swing’s the Thing, The PGA Championship: The Season’s Final Major, and the coauthor of Golf Rules & Etiquette Simplified. Byron Nelson was a professional golfer who won numerous tournaments in his career but is most famous for his 1945 season. Phil Mickelson is a professional golfer who has won four major championships and a total of 39 events on the PGA Tour, including three Masters Tournaments. year. No golfer since has come close to such perfection. age 46, before Arnold Palmer won the 1960 U.S. Open, before any of the historic wins by golf greats Tom Watson, Lee Trevino, Nick Faldo, or Greg Norman. Byron Nelson achieved what no other golfer will ever likely come close to doing again. Companiotte, who has covered golf for more than 15 years as a print journalist, spent years researching the details and anecdotes behind Nelson’s unequaled season. By examining each week on the PGA Tour that season, Companiotte has unearthed hundreds of details and anecdotes from that year which reveal in never-before-printed detail how Nelson was able to maintain such an astounding degree of concentration and determination during the six-month reign. But Byron Nelson isn’t a book just for golf fans seeking to learn more about the sport they love. Byron Nelson reveals how Nelson helped changed the sporting landscape across the country. Part biography, part sociological analysis and part psychological examination, Byron Nelson explains how the sport had fallen out of the limelight with the masses. The great Bobby Jones had long retired, taking with him the huge audiences who thronged to see him play. Then there was World War II which, of course, gave the country more serious concerns to focus on and led to the cancellation of the 1943 PGA Tour. The result for golf was that it became a sport which struggled to gain even a modicum of attention that it possessed just a few short years earlier. Golf needed a hero to resurrect itself. Nelson’s historic season did just that. The attention Nelson brought to golf created the interest in the sport that led to its popularity today and the financial opportunities for the PGA Tour players. 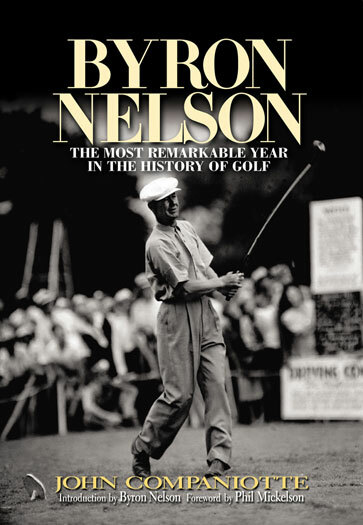 Byron Nelson is a book not just for sports fans, but for anyone interested in history, intrigued with one man’s drive to overcome great odds and achieve the greatest heights of his profession.